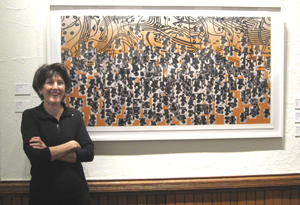 Shirley Steele creates artwork to explore fresh ideas about human thinking and our thinking machines. Her artwork combines computer programming, inkjet printing, photography, video, and traditional painting. The images suggest new ways to think about human language, the language of machines, and our dialogue with them. Steele's current artistic practice is informed by her career as a research scientist in speech and linguistics. After earning a Ph.D. in Brain and Language (University of Texas, Dallas), she worked as a research scientist in computer speech recognition and speech synthesis at Texas Instruments (Dallas), AT&T Bell Laboratories (Murray Hill, NJ), and Unisys Corporation (Philadelphia). While working at Bell Labs, Steele became interested in the art-making potential of computers, and at the same time, she studied painting and drawing at the Art Students’ League in New York. Later, after leaving speech research for a career in art, she graduated from the 4-year program in painting and printmaking at the Pennsylvania Academy of the Fine Arts in Philadelphia. Since then, she has made artwork by combining traditional arts training and computer skills. Her work is currently represented by Ceres Gallery (NYC).